I’ve been on a most delightful, bizarre, and poignant Grey Gardens kick over the past couple of weeks. Grey Gardens is a beautiful and disturbing documentary from the mid-70s about “Big Edie” and “Little Edie” Beale of East Hampton, Aunt and Cousin to Jacqueline Onassis-Kennedy respectively. Always lacking in conformity to the demands of aristocracy, they became outcasts and eventually recluses, holing up in their dilapidating 28 room mansion, alone and in complete squalor. East Hampton officials demanded that the house be cleaned up to standards or they would be arrested, which the media descended upon since these two were related to the Kennedy/Onassis clan. The brothers Maysle befriended the Edies and documented their lives after the “raid” from the city, capturing one of the most unusual and surprisingly haunting relationships I’ve ever seen. While it would be easy to dismiss the Edies as crazy and/or just plain sad, they were entirely present and coherent, with some gems of life observations. I finally watched the documentary a couple of weeks ago, then watched it again with Johnny and then again with Jip. I brought it with me to Chicago and watched it yet again with Ann. It’s a cult classic for a reason because the feelings and thoughts and images that come from this film stay with you for days and weeks. From this classic sprang Grey Gardens, The Musical on Broadway, a sequel to Grey Gardens called The Beales of Grey Gardens created from original footage, which fleshes out the Beales even further with some of the most comical and poignant scenes I’ve ever enjoyed, and now a feature film starring Drew Barrymore as Little Edie and Jessica Lange as Big Edie is set to hit HBO this year. Something about these two women and the choices of their lives are both inspiring and upsetting because they represent a part of all of us who so desperately wish to be an important and meaningful part of this world, but sometimes we all feel the creeping up of the comfort that could be found in the complete resignation and retreat from the very things we crave. 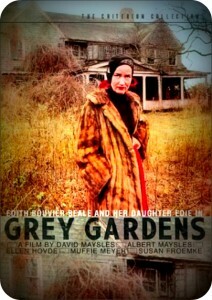 Below is the original Trailer for the original Grey Gardens and here’s the official site for all things Grey Gardens. The SNEAK PEAK for HBO’s Grey Gardens. Oh, definitely check it out! I think you would find it utterly fascinating. did you see the musical? I loved it. I did not see the musical, but it’s one that I bet I would have loved!